Find out who are major annual awards are named after, and their contribution to our league. Dhara Kerr was born in Warrnambool, Victoria 28 August 1971 and died in Perth, WA 13 October 1995. She was the youngest of four children and moved to Perth in 1992. In the same year, she started playing football for Innaloo. For her club, Dhara won the Fairest & Best award from 1992-95 and she captained her club to their first premiership in 1995. In the grand finals that Dhara played in, she shared the Best on Ground award with Sharon Woods in 1993 and won this award out-right in 1994 and 1995. In addition to these awards, Dhara won the League’s Fairest & Best award from 1992–1994. In 1994, Dhara was selected as Deputy Vice-Captain for the League’s first state team that played against Adelaide in South Australia. In that game she was award the Best on Ground for WA. During the years that Dhara played football, there was fierce on-field rivalry between Innaloo (now Claremont) and Carlisle (also known as Vic Park, Canning, Belmont, Southern Thunder and now Swan Districts). Following Dhara’s death, the two teams decided that the first time they meet each season be dedicated to Dhara’s memory. Joanne is the founding President of the WAWFL. As there were no league here in WA, Joanne decided to start her own playing for Innaloo first while President, then after a break for a couple of years came back and played for Vic Park, who changed their name to Belmont. There was an enormous amount of thought that went into the rules by meeting with WAFL, FDT, umpires and the girls playing. A group of girls formed a committee similar that of today. There were many meetings to discuss different ways to continually promote ourselves, to get enough players to fill teams. There was a fair bit of sexism about the whole idea of women playing football. Joanne has had football players (on film) training at the same oval saying that we should stick to cheerleading. There was no junior component at this stage as Jo’s focus was to build the membership of the league to a safe level before attempting to expand the competition to juniors and interstate. A junior competition has always been in her sight. Joanne’s initial work has developed into a growing league that it is today. Joanne was honoured with her Life Membership in 1997. Cath started playing in 1989 and finished in 1999. She was the Comp coordinatorfrom 91 and 92, secretary from 93-97, president from 98-99 for the WAWFL. Cath currently holds the record for most games for Melville - over 150. She also held together Melville/Murdoch in 1993 and did the hard yards for the club back then. Cath is the first Life member of the WAWFL, being inducted in 1994. Louise started playing Australian Rules football at school in Geelong, Victoria. Thenwhen she moved to WA and joined a boys U/11’s football team, (Koonga Valley). She played amongst players such as former Docker Dion Woods. 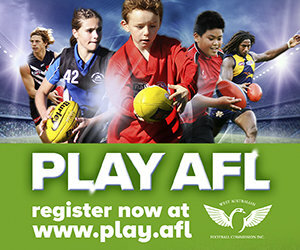 It wasn’t until U/13’s that the football commission triedto ban her from playing. Half way through the season it was ruled that Lou could keep playing with the boys until the age of 16. It was this year she came runner up to Dion Woods in the best and fairest count. In 1996 at the ripe old of age of 14, Lou’s coach suggested she plays for the Koonga Valley Women’s team. This is where her Women’s Australian Rules football career began. Louise was named in the inaugural Team of the Decade (1988-1997) and the Team of the Decade (1998-2007). In 1996 she was awarded the WAWFL Best First Year Player and Fairest and Best (both awards were debarred because of she was under the age limit for the league). She returned in the following year (1997) to win the Fairest and Best award legally under the WAWFL By-laws. Louise also won the award from 2003 – 2005 and was the runner up in 2006, but again taking out the award in 2007. For her club Koongamia, she was awarded Fairest and Best in 1996, 1997, Fairest and Best for Forrestfield in 1998. In the 1999 season, Louise’s season ended with a knee injury. She came back and played in 2001 where again was award Fairest and Best for Forrestfield as well as in 2002, 2003, 2004 and 2005. Louise then changed clubs to Gosnells as Forrestfield folded. There she won Fairest and Best in 2006 and runner up in 2007. In 2008, Louise suffered a horrific internal injury and retired from football. In 2011 she returned to Swan Districts Football club winning Most Courageous player award. Louise has represented WA in several state teams – 1998, 2003, 2005, 2006 and 2011. She was named in the All Australian Team in 2003, 2005, 2006. Also in 2006, she was named in the International Rules Squad member. Louise was also a committee member in 2003 and 2004 and did the boundary umpiring for the Sunday Football League in 2003. Lynette started playing football in 1989 with the Melville Warriors after hearingabout the women’s league on the 6pm news. In her first year she was voted with her clubs Fairest and Best Award. She was also a member of the 1990 and 1991 premiership teams and in 1992, became a committee member with the combined Melville Men and Women’s Football Club, thereby starting her numerous volunteering roles in the game. Lynette was also a member of the inaugural State Team in 1994 as the Ruck and named in the first ever Team of the Decade (1988 – 1997). In July 1997 ‘Smitty’ damaged a cruciate ligament so spent the rest of that season as Assistant Coach for Melville, who changed their name to the Melville Dockers. From 1997 to 2001 Smitty took on a variety of roles including President, Secretary and Treasurer. In 2007 she pulled on the boots again to assist the division 2 Melville Sharks team reaching the preliminary finals and reaching her 100th game. Lynette joined the WAWFL Committee in 1998 - 1999 as the Competition Coordinator and became the Inaugural State Team Manager in 1999 in Melbourne. From 2000 – 2002 she was the Leagues’ Treasurer and in 2002 Lynette was awarded Life Membership of the WAWFL. After a short time living up north, Lynette returned in 2007 and again became the Leagues Treasurer. Lynette also became involved in her beloved club East Fremantle (who changed their name from Melville). With her longevity at the club, she was honoured with being the inaugural life member after 20 years of service as a player, president and secretary and received the same struck medal as the men to recognise the continuing partnership with the men’s club and instil the same culture of pride in the women for their achievements. Whilst not playing Lynette remained involved with the club and helped out in numerous ways including boundary umpiring, goal umpiring, massages, running water, organising fundraisers and cocktail nights as well as training. Charmaine started out as team manager and runner for the boys’ junior team thather brother coached. Charmaine didn’t have the option to play football at a young age but that was until 1993 when she saw an article in the local community newspaper with a photo of some of the Innaloo players and a contact number. This was the start of Charmaine’s football career. Since then she has had the honour of representing her state in the inaugural National competition in 1994; she’s been a vice-captain, captain, coach and president of Innaloo Women’s Football Club; as a League Board member she has been a passionate and influential advocate for the female game – she has held the positions of junior schoolgirls committee member, competition co-ordinator, secretary, vice president, president, and Community Football Council representative. In 2001 the WAWFL had the honour of inviting Charmaine to become a Life Member of the West Australian Women’s Football League. Entered the WAWFL with 1st game at Gosnells 13 April 1997 and played 4 years for Gosnells, during which time Lil was Club Captain & won either Fairest & Best or was runner up. She was the Manager of Gosnells 1999 and maybe held more positions within her club. She was named in the Inaugural Team of the Decade 1988 – 1997 as emergency player. Lil was also named in the Team of the Decade 1998 – 2007. She represented her state in the 1998 and 1999 state team and was named Best Player of the Championships in the Inaugural National Women’s Football Championships in 1998. Lil has helped on the WAWFL State Team Sub Committee and the WAWFL Vice President in 2000. Sharon was one of the League’s inaugural players starting in 1988 with Carlisle (then Vic Park, Canning, Belmont, Forrestfield & Gosnells). She became the League’s first appointed Treasurer from 1993 – 1995. Sharon became the League’s second life member being appointed in 1995. During her playing career, Sharon has been award various Best on Grounds in the Grand Finals and shared this award with Dhara Kerr in 1993. She was selected for the Inaugural State Team in 1994 which she also captained the team. The first ever Team of the Decade (1988 – 1997) Sharon was selected in the team as half back flank. She was also selected in the Team of the Decade (1998 – 2007) as back pocket and was also award the captaincy roll. Sharon became the captain of her club, Belmont, in 1997 which she held for several years as well as other positions on her Club’s Committee. In 1999 she was on the State Team committee for the Inaugural National Championships which was held in Victoria. Sharon also was selected for this team and was the State Team Captain.